It was a symbolic demand. The 11 men who sued the Fort Worth Roman Catholic Diocese, saying they were sexually abused as altar boys by the Rev. James Reilly, wanted his name to disappear. They wanted it removed from plaques, statues, buildings and any other objects in the 28-county diocese. One of the men, now a professor at an Austin university, still feels disgust thinking about the building at St. Maria Goretti Catholic Church in Arlington that bears the priest's name. Despite the fact that some of the allegations date back more than 20 years -- past the legal deadline for such lawsuits -- the diocese agreed Wednesday to a settlement with the men, who said they were as young as 8 when they were abused. The settlement will pay the group at least $1 million, though exact financial terms weren't revealed, at the men's request. The Rev. James Reilly stands next to a plaque during the dedication of a building at St. Maria Goretti Catholic Church in Arlington in the mid-1970s. 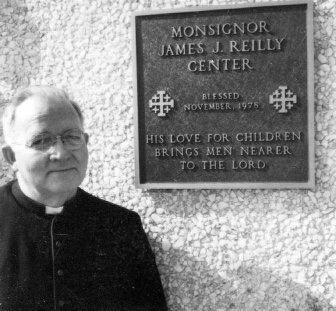 The diocese has agreed to remove the plaque and rename the building as part of a settlement with 11 men who say Reilly abused them. The James J. Reilly Center at St. Maria Goretti will be renamed, said Tahira Khan Merritt, the Dallas attorney who represented the men. And, most important to the men, they will get an apology. Reilly died in 1999 from complications of Alzheimer's disease. Another of Reilly's accusers, a man who lives in Tarrant County, said erasing the priest's name is important to the men. "They were horrific acts that had occurred on church property, and we feel there needs to be that separation ... the removal of his presence from the property," he said. The men will receive counseling at the diocese's expense. And a trust fund of about $600,000 that Reilly set up to benefit the diocese will be used to pay for counseling of child victims of sexual abuse by Fort Worth Catholic priests, Merritt said. The agreement also requires Bishop Kevin Vann to hold Masses at the parish to acknowledge the abuse and to apologize, Merritt said. Vann became bishop last year, long after Reilly left the diocese. In a written statement, Vann said he would hold a Mass of Reparation at the church to ask God's forgiveness and to publicly acknowledge the "crimes against these victims." "I am appalled, ashamed and angered that any priest acted in this way -- presenting himself one way, acting in another," Vann said. "It was a breach of trust; a time that should have been one of faith and growth became a time of fear, tragedy and loss of faith." Reilly led St. Maria Goretti from November 1967 until September 1987 and also served as an instructor at Holy Trinity Seminary in Irving. Five of the men who accused him live in Tarrant County. The others live in Harris and Travis counties, Virginia and Washington, according to court documents. The lawsuit also alleged that Vann's predecessor, Bishop Joseph P. Delaney, "spirited Reilly out of Texas" and allowed Reilly to work at a parish in Philadelphia "despite the knowledge that he was a sexually predatory cleric." Delaney accepted Reilly's request for retirement because of health reasons, and there is no evidence that Reilly was spirited out of Texas, said Mark Hatten, a Fort Worth attorney who represented the diocese. "He wanted to go back up to Philadelphia ... to live out his years with his family," Hatten said. The lawsuit is the second that Merritt has brought in which the diocese argued that the statute of limitations should prevent the case from going forward. She represented two men who accused the Rev. Thomas Teczar of abusing them in Ranger, west of Fort Worth, when they were boys in the 1990s. Last year, they received a $4.15 million out-of-court settlement, despite the expiration of the legal deadline to file such suits. Teczar, who faces related criminal charges in Eastland County, has said he did not abuse the men. The diocese denied any wrongdoing as part of the settlement. Merritt said her cases have prevailed because the diocese's leadership showed a pattern of cover-up that could nullify the statute of limitations. But Hatten said the diocese had no knowledge of Reilly's alleged wrongdoing or any part in concealing it. There is no evidence to support Merritt's accusations, he said. "Our knowledge came way after these events occurred," he said, adding that he could not comment on specifics of the settlement because of a confidentiality agreement. Reilly and Teczar are among eight Fort Worth priests accused of sexual misconduct with minors. Details of accusations against Teczar had been made public through a lawsuit his accusers filed against the diocese. Confidential personnel files detailing allegations against Reilly and several of the other priests are expected to be released next week, Hatten said. The files, sealed as part of the Teczar case, have been sought by the Star-Telegram and The Dallas Morning News. The Austin professor who sued the diocese said some of Reilly's accusers may feel a chapter closing for them. But for him, identified in court documents as John Doe IV, it will never close, he said. He was 11 when Reilly began abusing him at St. Maria Goretti, according to court documents. Reilly made the boy sit on his lap, sank his long fingernails into the boy's head, and forced his tongue down his throat while fondling him, the documents state. When Vann tells parishioners the truth, they will realize they were duped, he said. "They're going to feel betrayed," he said, "and that's what it was."